Persimmon – Sexiest fruit alive! Persimmons are known to the ancient Greeks as “The fruit of the gods.” They are generally first available in November and are an often overlooked brightly colored orange fruit that are rich in fiber, minerals, and natural sugars. They must be fully ripe and soft to the touch to use or else they will taste quite puckery. There’s nothing quite like biting into a fully ripe persimmon and letting it burst in your mouth with its sweet succulent flavor! This entry was posted in food, fruit, health, healthy, seasonal and tagged "Fruit of the gods. 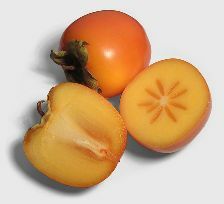 ", fruit, persimmon, succulent. Bookmark the permalink.